Table notes 1-2: The PAI is listed here with three significant digits. However, the PAI used to calculate the county ranking contained 15 significant digits. 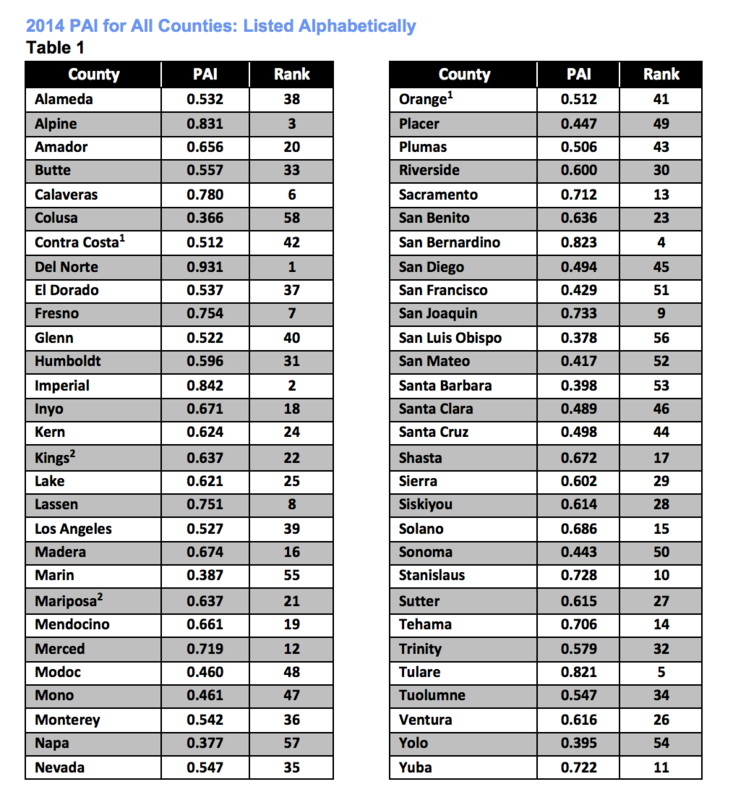 Viewed with four significant digits, Orange County's PAI is 0.5116 and Contra Costa County's PAI is 0.5115. Thus, their respective ranks are 41 and 42. 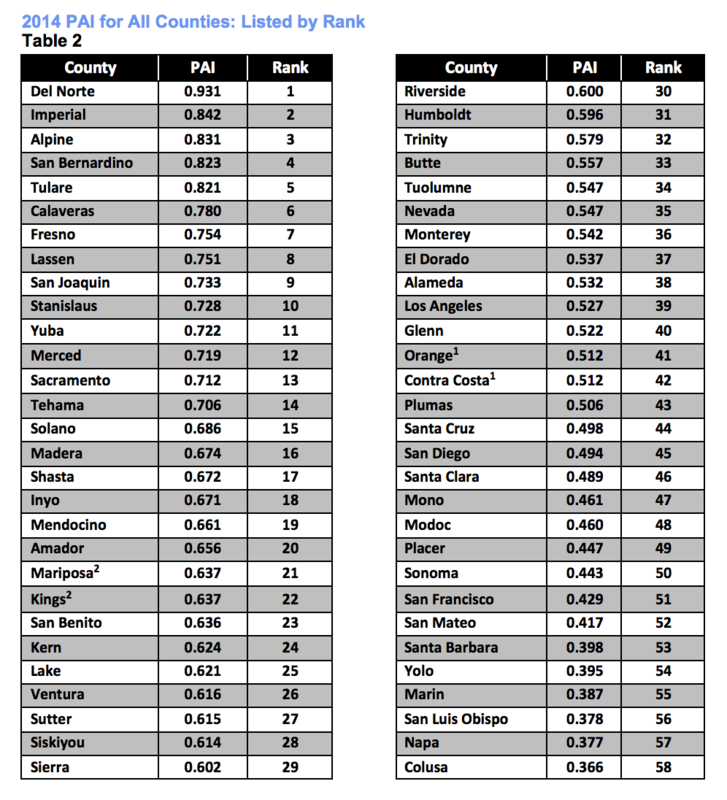 Similarly, Mariposa County's PAI is 0.6373 and Kings County's PAI is 0.6369. 1 Until July 1, 2014 eligibility criteria for CalFresh allowed participants to have incomes up to 130 percent of the federal poverty guidelines (FPG). The 2014-15 State Budget included a provision to increase the gross income limit to 200% of the FPL for the TANF-funded service that confers categorical eligibility for all CalFresh households. Practically speaking, this change raised the CalFresh gross income limit from 130% FPL to 200% FPL. The net income limit of 100% still applies, except for households containing a senior or disabled member. (For more information on the opportunity to boost enrollment through modified categorical eligibility and the new gross income test, read our recent analysis.) Since the gross income limit changed mid-year, the 2014 PAI still utilizes the 130% FPL test. However, annual county-level estimates are not available for the number of individuals with incomes below 130 percent of FPG. Therefore, having an income below 125 percent of the federal poverty threshold is used as a proxy for CalFresh income eligibility. The use of this proxy may underestimate the number of individuals who are income-eligible for CalFresh. 3 In California, SSI recipients are not eligible for CalFresh/SNAP.